AS THE SAYING GOES, “TWO HEADS ARE BETTER THAN ONE”, SO 10 HEADS MUST BE SPLENDID. FROM A UNIQUE INITIATIVE BETWEEN LISMORE REGIONAL GALLERY AND THE MUSIC FESTIVAL SPLENDOUR IN THE GRASS, IN PARTNERSHIP WITH THE AUSTRALIA COUNCIL, NORTHERN RIVERS PERFORMING ARTS (NORPA) AND ARTS NORTHERN RIVERS, COMES SPLENDID, A NEW EXPERIMENTAL ARTS PROGRAM AIMED AT PUSHING THE BOUNDARIES BETWEEN ART AND AUDIENCE, PUTTING THEORY TO THE TEST. 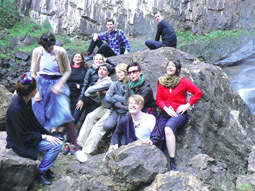 Through a series of ‘arts labs’ and project commissions, Splendid’s organisers claim that it will “build on the culture of experimentation and interdisciplinary practice in Australia by facilitating opportunities for young and emerging artists to conceptualise and create work for mass audiences” (http://splendid.org.au). Mass audience might be somewhat of an understatement: Splendour In The Grass, boasting 17,000+ in attendance, may as well be its own city-state. Attracting music from across the globe, it is a world-class festival situated in the idyllic setting of Byron Bay, Northern New South Wales. Focusing on ideas generation and artistic collaboration, the Splendid Arts Lab was an intensive three-week residency involving 10 Australian artists (“the Splendid Ten”) and a team of artist provocateurs. It was conceived as an experiment in bringing together young and emerging artists interested in transcending their disciplines and working collectively to generate work for a music festival site. As Splendid provocateur Tom Barker described it, “making work for Splendour is like making work for a war zone.” Far removed from the gallery or white cube where much art regularly finds itself, the festival is moving, vibrational and explosive; an “assault on the senses” as participating visual artist Carl Scrase, put it. Confronted with this challenge, the Splendid artists were immersed within a think-tank styled residency as a means of unraveling the complexities of cross-art form collaboration. Focused on challenging each individual into novel engagement with their own distinctive working methods, the artists were placed within the microscope of the Lab for what coordinating provocateur Rebecca Conroy described as “open art surgery.” As artists spread out their practices on the Lab’s (operating) table, ideas seemed to transplant and cross-pollinate. Beyond this, the Lab became much more than simply a synthesis of artistic team challenges or a collage of practices. Artistic collaboration is not easily deconstructed, nor reducible to the juxtaposition of disparate art forms and working processes. Often the lived space that insulates and informs these practices is at the heart of the act of collaboration, shaping an identity through which art forms take on voice and become personal. This realisation came through experiencing the qualities of the Lab as a residency. Perhaps it was through cohabitation that the group aesthetic developed. In the domestic activity of sharing house, food and spirit, the artists engaged in an essential dialogue at the core of working together creatively. As multi-media artist Daniel Tanner related, “The best ideas came from sharing a meal or chatting over a tea in the evenings.” As the mutual engagement with an emerging artefact, collaborations can be found even in the most quotidian and customary acts. Artistic collaboration, in this instance, might be considered as a form of ‘coming-out’; an emergence of process-as-outcome. This entanglement between process and outcome transpired as a very specific challenge of the Lab. As one of participants, “cross-artformer” Dario Vacirca, pointed out, “process is one of our goals…challenging the scale and meaning of collaboration and how it works.” So when is the focus on generating a collaborative process and when is it on producing viable outcomes in the form of art? It seemed a question of articulation: when does art ‘work’ become artwork within collective practice? The final provocation of the Lab, a project proposal pitch coined “The Itch” (pitch minus p) stretched out this tension between process and outcome. By sounding ideas amongst the provocateurs, curatorium and each other the group generated and solidified their collective vision, mapping-out individual intentions and inspirations about how best to integrate their diverse practices. The presentations offered closer glimpses into each collaborator, how they worked, their creative voice and style. As the artists showcased their visions of flash dance mobs, interactive mobile phone interventions and performative fantasy environments, what emerged was a front-row demonstration of each collaborator’s working style, their strengths and weaknesses as individual practitioners within the Splendid Ten. The basis of The Itch was to communicate potential projects for Splendour In The Grass to the panel and facilitate a forum of discussion on how these concepts and ideas could be further developed in the next phase of Splendid. Equally important was The Itch’s function as a testing ground for each artist to enunciate their creative voice within the collaborative language of the group. Artistic collaboration within Splendid is a continuous negotiation of not only process and outcome, but also self and other; an instance in which boundaries between entities become confused, obscured and fluid. This type of playful self-enquiry, losing and relocating oneself amidst the universality of the others, orientates an exploration of a certain course of exchange. As visual artist Alice Lang acknowledged,“ It has made me analyse the way in which I work, the type of work that I make and the kind of work that can be created through developing creative partnerships.” In these ways the Arts Lab was generative, layered and unpredictable. Reminding the group of the importance of this “seeding process” and denoting the Lab’s experimental dynamic, provocateur Dominico De Clario reassured the artists that in every creative situation “99% happens after the event. You experience then you think.” Concluding that while the past three weeks had been emotionally, physically, and intellectually demanding, De Clario suggested, “If anything makes you uncomfortable it is really, really useful. It’s a gift, explore this.” Splendid Arts Lab is a fertile site for planting these seeds that will germinate into some larger-than-life cross-art collaborations and innovative artworks at Splendour In The Grass 2010. Splendid: Art, Ideas, Experience, Arts Lab, lab artists: Alice Lang, Kristy Ayre, Shakthi Sivanathan, Mish Grigor, Dario Vacirca, Lachlan Tetlow-Stuart, Lauren Brincat, Daniel Tanner, Carl Scrase, Dominic Finlay-Jones; mentors Deborah Pollard, Rebecca Conroy, Jenny Fraser, Mickie Quick, Tom Barker, Natalie Cursio, Domenico De Clario, Julian Louis, Tom Rivard, Craig Walsh, Andy Forbes; Lismore, July 20-Aug 7, www.splendid.org.au.